The 17 SDGs Goals were built on the successes of the Millennium Development Goals while including new areas such as climate change, economic inequality, innovation, sustainable consumption, peace and justice, among other priorities. The goals are interconnected – often the key to success on one will involve tackling issues more commonly associated with another. The Nigerian Youth SDGS Forum #NGYouthSDGs had a gathering of high-level stakeholders pre-summit in Abuja on July 7, 2017 and I was privileged to represent CODE at this event. The event was hosted by the Ambassador of Denmark, Torben Gettermann at the Switzerland Embassy. The forum brought together Civic Organizations and Youth Networks, working to reach the sustainable goals. Uche Onyinye of TheirWorld.UK spoke on the Nigeria Future – in relation to achieving the SGDs. She explained the goals for all parties involved is the same toward achieving the goals. She went further to explain that the SDGs are timed based goals and we have few years (13 years) to see these goals come to life. She ended by stating that SDGs and Nigeria’s future are intertwined, they can’t be separated. It was quite fascinating for me to see that various organisations are already building programs and projects around achieving the SDGs. For instance, Serah Makka, Country director for ONE Campaign added that Accountability is the life of democracy and to achieve SDGs, young people have to be active in civic engagement. She spoke on ONE Campaign effort in education and eliminating poverty and making health and agriculture a focus of work. Mr Kingsley from Plan International explained how they work with the grassroot community to impact the young people on SDGs. Chibugo Okafor with Wellbeing Africa explained their focus on health awareness using innovative adolescents program e.g teaching them general hygeine etc will promote and improve the SDGs. 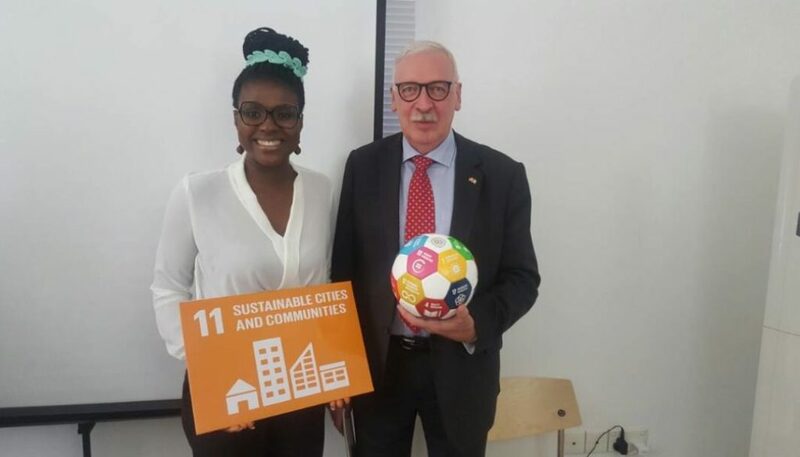 For most of these organizations, working with young people in achieving the various goal interest was a major strength for example Ijeoma Idika Okorie of Teenz Global Foundation,who works with teenagers in high schools, stated that ownership of ideas through partnership and dedication towards SDGs is key to success in Nigeria.